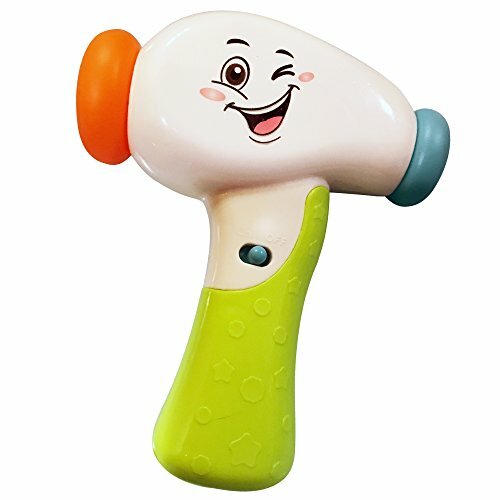 INTERACTIVE TOY TOOL - Colorful, Easy Grip, Kid-Friendly Toy Hammer for Active Little Kids, Soft Ends for Fun Playtime with a Happy Baby Hammer! 朗EXCELLENT MAKE-BELIEVE TOY - A Great Tool for Any Child Who Loves To Pretend to Build Things! The LilPals Baby Hammer Is A Cute Toy For Kids Learning To Use Fine-Motor Skills As Well! ❤️PERFECT, SIMPLE GIFT - Baby Hammer Toy Is An Excellent Gift for Any Child! It Is A Great Gift for Active Kids Who Love to Play! 100% SATISFACTION GUARANTEE - We Take Care Of Our Customers! So We Offer A Fully-Backed Experience With Our Toys With A 100% Satisfaction Guaranteed!